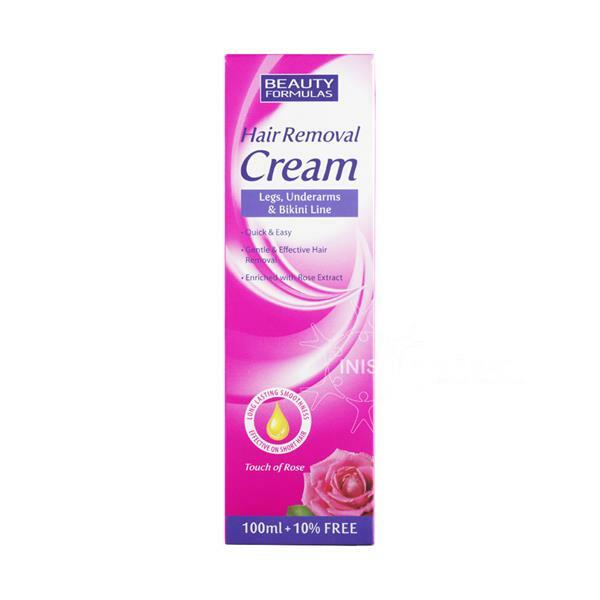 Beauty Formulas Hair Removal Cream is enriched with honey, emollient oils and beeswax that help to maintain smooth skin. This rose fragrance cream effectively removes unwanted hair from legs, arms and body. It is recommended that you patch test a small area first. Apply evenly using the applicator and leave for 5 minutes. Test a small patch to check removal. Coarse hair may take a little longer. Do not leave longer than 10 minutes. Rinse with tepid water. Not suitable for the face. Do not use hot water or soap immediately before or after applying the cream. Aqua, Cetearyl alcohol, Calcium thioglycolate, Propylene glycol, Paraffinum liquidum, PPG-15, Stearyl ether, Urea, Ceteareth-20, Glycerin, Sodium hydroxide, Cera alba (beeswax), Lanolin, Sodium lactate, Ceteareth-12, Parfum (fragrance), Hydrated silica, Sodium gluconate, Hectorite, Hydroxyethylcellulose, Petrolatum, Mel (honey), Hexyl cinnamal, Benzyl salicylate, CI 12490.